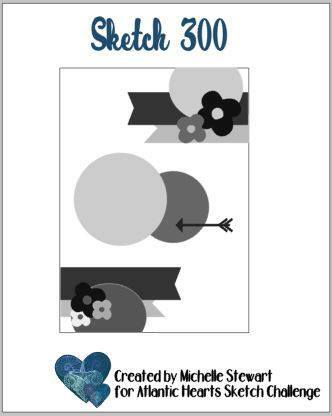 It's time to share a new sketch from Atlantic Hearts Sketch Challenge...and it's #300!!! Can you imagine, 300 sketches?!!!! If you ever need inspiration, be sure and check out all 299 other sketches! Here's what I created, using from the Occasions catalog the Meant to Be bundle. I waited a while before ordering this bundle...and I don't know why!!! It's fabulous!!!!! You won't be disappointed with it, that's for sure! When I initially started out designing this card, I just had a plain white layer. I knew something was missing so the embossing folder was exactly what it needed. Then the little hearts in the upper and lower corners weren't popping, so I added some Wink of Stella and love the sparkly goodness it gives! 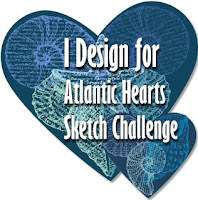 I sure hope you can join us this week over at Atlantic Hearts Sketch Challenge. We'd love to see what you create!